DO YOU COOK TO LIVE OR LIVE TO COOK? My son, a technical education teacher once said, “There are two types of workers in the world; those who shower before work and those who shower after.” I thought this was quite profound and a way to categorize the type of work people do and the mentality of those who do it. Having been around restaurants and kitchens in particular, for many years, I could classify people who work in kitchens as those who take on the role of cook to simply pay their bills vs. those who see the opportunity to cook as a calling; a form of personal expression. There are ample opportunities for both types of cooks in an industry closing in on $500 billion in U.S. sales alone. Those who work for a paycheck can and often are, accomplished at their craft, however, it is a job. In some cases, operations can even disregard the talent portion of cooking and substitute stringent standards and procedures, convenience and foolproof methods to compensate for a lack of real cooking talent. The end result can still be an acceptable product, one that relishes consistency above all else. This is fine; there is a substantial market for this type of restaurant. Those who view their position as an opportunity to learn, grow and master skills, who thrive on any opportunity to self-express through food, are in a much different mental and emotional space. In 1968, Frank Zappa and the Mother’s of Invention, recorded an album titled: We’re Only in it for the Money. This was, of course, a satirical work that poked fun at the culture of the time and did not reflect, at all, Zappa’s insatiable thirst to be creative and expressive. He was, as many musicians would agree, a genius of composition and an exceptional guitarist who looked at music as a medium for communicating his gift. There are many chefs and cooks today who seek to use food in the same manner that Zappa used music. These are the relentless craftspeople that seek perfection in what they do, the cooks who work with food because it is what they were meant to do. There are a growing number of very talented and committed chefs who have been able to serve both the desire to make a very good living at cooking as well as satisfy their true need to make a statement and live to cook. We know their names: Boulud, Keller, Vongerichten, Ducasse, Waters, Samuelsson, English and numerous others who have built culinary empires while continually exceeding customer expectations. This marriage of desire and need is admirable and well deserved, however, what about the tens of thousands of passionate cooks who also have a need for expression and are always in search of knowledge, skill and perfection? 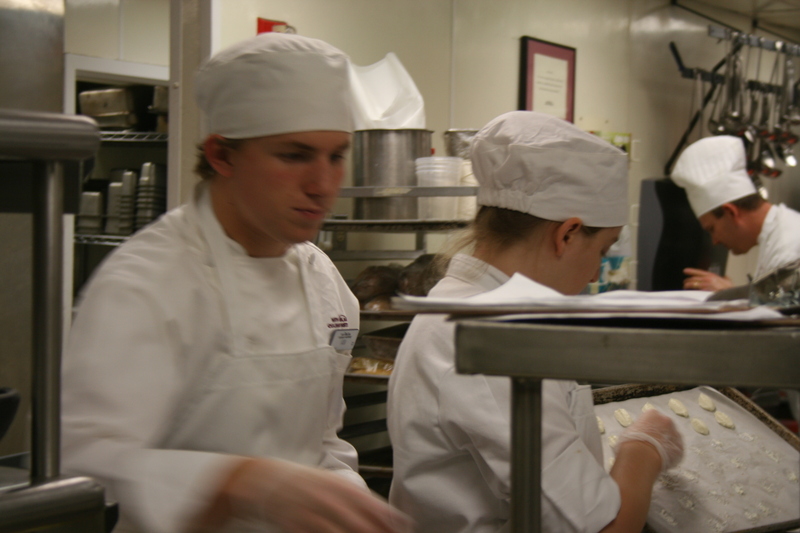 Those great chefs came from the same seed of commitment that these young cooks share. I just finished watching a video tribute to the late Charlie Trotter who, in many American chefs eyes, was the driving force behind a movement towards culinary artistry and self-expression that prominent chefs share today. He was, for those who did not have an opportunity to dine at Charlie Trotter’s in Chicago, a true culinary genius. It was not just his ability to cook, but more importantly his knowledge of and appreciation for ingredients that set the tone in his kitchen. It was his passion for unheard of service and attention to detail that became the foundation for the great restaurants that followed: The French Laundry, Daniel, Gramercy Tavern, Tru, Alinea, Gary Danko, Eleven Madison and many, many others. There was little question that Trotter made a good living, but more importantly, he raised the bar and helped to create a new level of commitment to excellence. His kitchen and dining room was populated by young cooks and servers who shared a level of passion for creativity, discipline and unwavering commitment to doing it right. These are the people who have become the new generation of chefs and restaurateurs; those professionals who provide an environment for yet another wave of crazy cooks and servers who live for the opportunity. The beauty of the restaurant industry is in those diverse opportunities for individuals passing through, in search of a way to pay the bills as well as those who are prepared to immerse themselves in a life of food. Just as there are those opportunities for different levels of commitment there are customers looking to restaurants for different results. Some are seeking an opportunity for nourishment and price while others are interested in the experience of sharing the passion of the cooks and chefs who are giving it all. The plate is the canvas for different levels of art appreciation. From the back of the house perspective, it is the level of commitment on the part of cooks that sets the tone for the restaurant and the experience of guests. Diners can feel that passion when they walk through the door and when they enjoy the first taste of food. The passion in the back of the house seeps into the overall experience of the restaurant; from the ambience to the quality of table top appointments; from the breadth and appropriateness of the wine list to the true hospitality and service excellence displayed by the front of the house staff. It all begins with the type of individual leaning over the stove. How important is food to the cook? How dedicated is the cook to learning about the ingredients and building his or her flavor memory? How focused is the cook on painting the plate in such a manner that the food experience becomes as much visual as taste? Do you cook to live or live to cook? This is a question that everyone who collects a paycheck in a restaurant should pose and answer. What do you bring to the table? Sometimes people don’t realize that being a chef, a true chef, is an art form in and of itself.